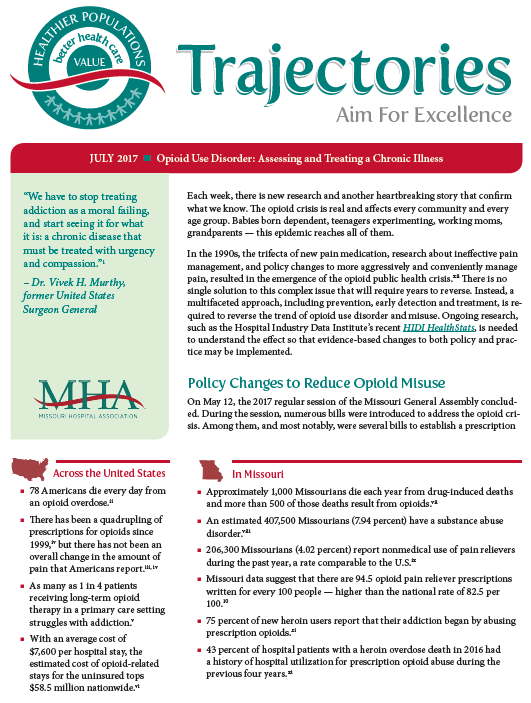 The July 2017 edition of Trajectories highlights the issue of opioid use and abuse. Each week, there is new research and another heartbreaking story that confirms what we know. The opioid crisis is real and affects every community and every age group. Babies born dependent, teenagers experimenting, working moms, grandparents — this epidemic reaches all of them. In the 1990s, the trifecta of new pain medication, research about ineffective pain management, and policy changes to more aggressively and conveniently manage pain, resulted in the emergence of the opioid public health crisis. There is no single solution to this complex issue that will require years to reverse. Instead, a multifaceted approach, including prevention, early detection and treatment, is required to reverse the trend of opioid use disorder and misuse. Ongoing research, such as the Hospital Industry Data Institute’s recent HIDI HealthStats, is needed to understand the effect so that evidence-based changes to both policy and practice may be implemented. On May 12, the 2017 regular session of the Missouri General Assembly concluded. During the session, numerous bills were introduced to address the opioid crisis. Among them, and most notably, were several bills to establish a prescription drug monitoring program — a web-based, HIPAA-secure repository of patient-specific, prescribed and filled narcotics. Ultimately, none of the PDMP bills passed and as a result, Missouri remains the only state without a PDMP. Despite this setback, Senate Bill 501 was truly agreed to and finally passed addressing substance abuse through the following actions. Grants immunity from arrest, prosecution or other penalties for certain drug-related crimes if the evidence was gained in the course of seeking medical assistance for a drug or alcohol overdose. Permits the director of the Missouri Department of Health and Senior Services or a physician designee to issue a statewide standing order for the use of naloxone to blunt the effect of an opioid overdose. Revises standards for medication-assisted treatment of substance abuse. The Health Care Foundation of Greater Kansas City has released its report of recommended reforms to Missouri’s Medicaid program. Recommendations were formed from surveys, interviews and focus groups with advocates, providers and consumers. The report recommends greater oversight of Medicaid managed care organizations, simplifying Medicaid eligibility, introducing coordinated care and primary care case management options for all Medicaid eligibility groups, including elders and the disabled. An estimated 407,500 Missourians (7.94 percent) have a substance abuse disorder.